Happy Friday everyone, I hope you are gearing up for a lovely weekend. I am looking forward to a little bit of me-time with a facial and haircut booked in for Saturday and then it is off to dinner in the evening to celebrate my gorgeous sister Heather's birthday. I was going through our portfolio of wedding cakes that The Little Oak Tree have had the pleasure of making over the past couple of months and thought I would post a few for you. 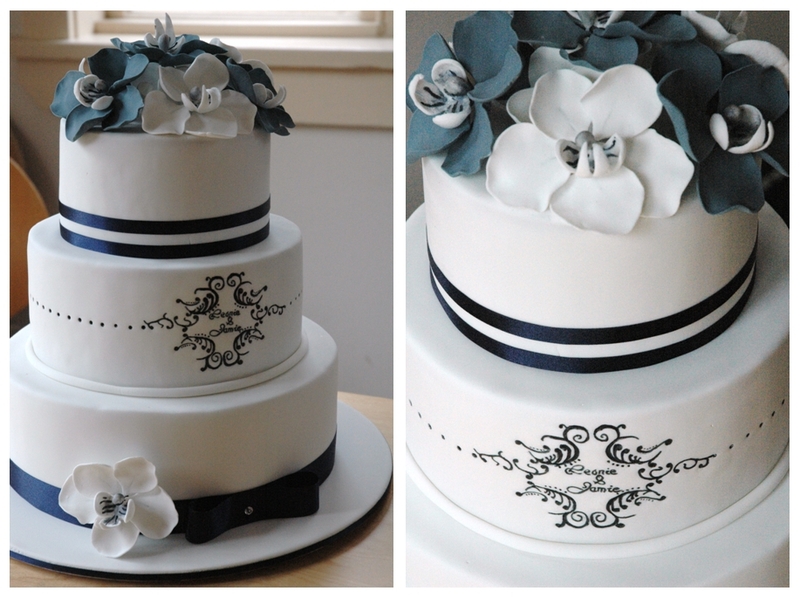 This was a three tier chocolate mud with stylized navy and white sugar orchids to tie in with the Bride's blue and white theme. 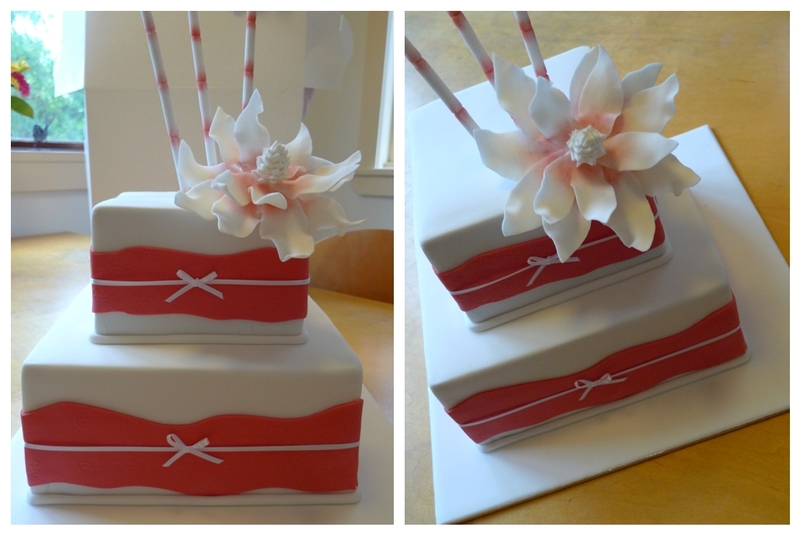 A square two tier caramel mud cake with fondant bamboo sticks and a gorgeous pink sugar magnolia. This three tier stunner had a mud cake base, a caramel mud middle tier and a strawberry mud top tier. 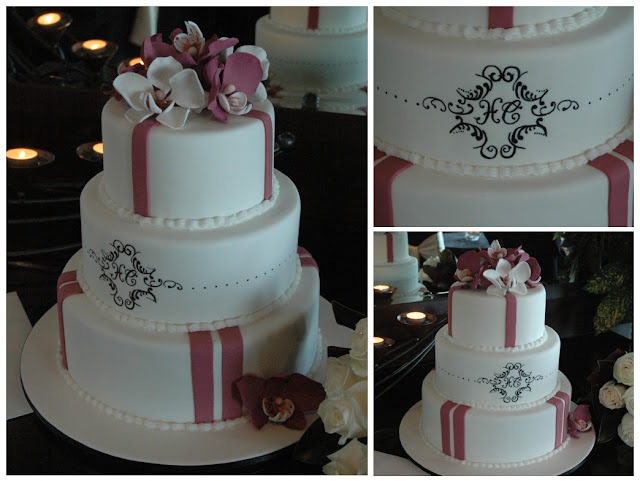 The orchids are hand made out of fondant. This pretty single tier cake was created for a small spring garden wedding. 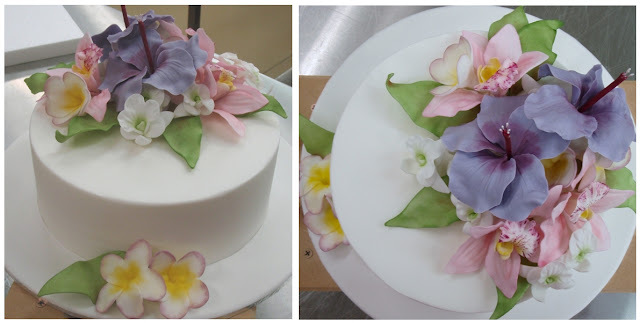 Although it may look quite simple in it's design, a plain white fondant covered cake is often the hardest to do as it will show every lump and bump if you make an error. The fondant has to be rolled thinly with precision and the cake must have a crisp sharp edge. The sugar flowers on this cake are all hand made and I think this is a lovely example of how good things can come in small packages. I couldn't resist showing you the cute-as-pie wedding cake topper that Trudy has just completed for a bride and groom. This will sit atop there three tier wedding cake. The little bouquet that the bride is holding matches the colour of her bouquet and the groom's waist coat is true to the colour theme as well. Pictures of the finished cake will follow soon. If you are interested in having a cute couple on the top of your wedding cake, Trudy can completely customise the figurines to tie in with your theme or perhaps reflect your tastes or interests as a couple, even the family dog can be included. The figurines are completely made from icing and can be purchased separately from a wedding cake if you like.